Recently, Steve Peters, a twenty year resident of MCP, spearheaded the Adopt the Park initiative. Steve is targeting sports leagues, local businesses, Girl and Boy Scouts, charitable organizations, local schools and more. His goal is to encourage each organization to adopt a section of the park. The park contains 135-acres of lake, natural habitat, wetlands and nature trails and needs constant support to keep its natural beauty. Through Steve's initiative, MCPC hopes to establish long-term relations with volunteering organizations in order to improve the park. 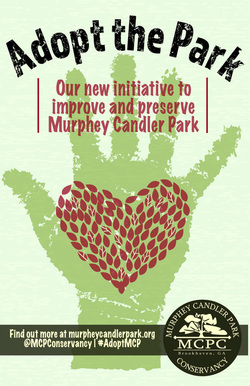 ​With your help, we can source volunteers from local organizations to improve and preserve Murphey Candler Park.